Photo: Chris Ratcliffe/ Getty Images. The latest poll by YouGov shows just how nail-bitingly close the result of the EU referendum is likely to be. The polling organisation’s latest figures show the Leave camp polling at 43% while Remain is trailing by just one point at 42% — the remainder is still undecided. The results will surely be welcomed by Brexiteers who appear to be gaining ground the closer we get to the referendum on June 23. The opposing campaigns have swapped places since YouGov’s last poll on June 6, which put the Remain campaign ahead by one point. 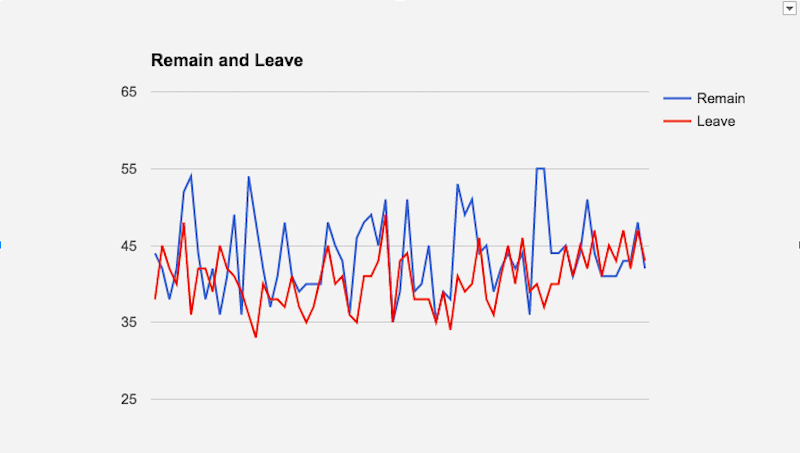 Leave has gone from strength to strength since January when in some instances it was trailing by up to 18 points. It is also worth noting that undecided voters are also expected to lean towards the Leave campaign. 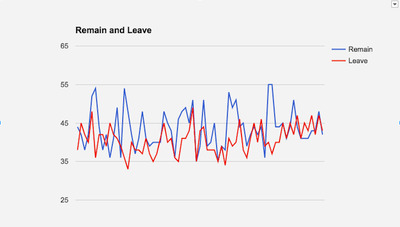 GoogleA graph showing the results of every Brexit poll from January 10 to June 12. In five out of six referendums held in Britain since 1975, support for the status quo options clearly grew the closer it got to voting day. YouGov’s polls have been fairly damning toward the Remain camp, which respondents have said is responsible for the most scaremongering, negativity, and dishonesty.